Learn how to knit funky Halloween witch hats. 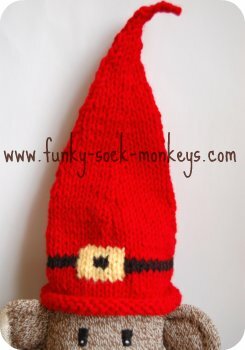 Free knitting patterns for sock monkey size and people size witch hats. Fun homemade wool knit hats to wear or to use as decorations. 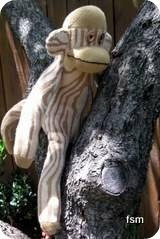 These are unique patterns I created one Halloween to decorate my crazy Halloween sock monkey dolls. There is nothing scary about these Halloween witch hats, they are more amusing than anything. Cast on 40 stitches in black yarn. 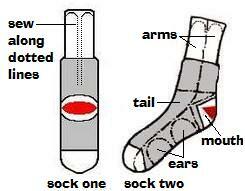 Tie off, leaving a long thread of black yarn which you will use to stitch the hat together. Now, instead of turning the witch hat right side in to sew it together you need to have the hat right side out. This is because of the point at the top of the hat, if the hat is sewn together right side in, you may have a super hard time trying to pop the point of the hat out. I find it is much easier to have the hat right side out and thread the end of my yarn down through the top of the point (pull the thread right through but don't pull it tight or you will lose the point of your hat), weave the thread back and forth through the rows, then start sewing the sides of the hat together. You can alter this pattern to get different looks. You can move the belt and buckle up the hat. Make the belt wider and of course knit it in any color you'd like. I have made white Halloween witch hats, black and purple witch hats. 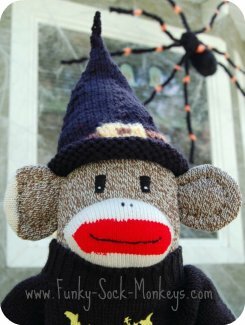 This is an original knitting pattern for kid size Halloween witch hats that is based on the mini sock monkey pattern above. You can use any color yarn you would like. Now we start to make the belt and buckle. Repeat rows 29 and 30 two more times. The belt and buckle are finished, the rest of the hat is made with black yarn. 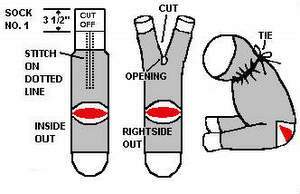 As above for the sock monkey Halloween witch hats, instead of turning the hats right side in to sew it together you need to have the hats right side out. This is because of the point at the top of the hat, if the hat is sewn together right side in, you may have a super hard time trying to pop the point of the hat out. I find it is much easier to have the hat right side out and thread the end of my yarn down through the top of the point (pull the thread right through but don't pull it tight or you will lose the point of your hat), weave the thread back and forth through the rows, then start sewing the sides of the hat together. You can make a large adult size witches hat by simply casting on more stitches and adjusting the pattern accordingly. Other than making a sock witch doll and add a mini Halloween witch hat to the costume. Another idea is to stuff the hats slightly before putting them on someones head, this would add some substance the top half of the Halloween witch hats and they would stand up more erect. Accessories can be added such as spiders and cobwebs.